Lamar Davenport, 33, was sentenced to 20 years in state prison following the fatal stabbing of his girlfriend E’Dena Hines, who was actor Morgan Freeman’s step-granddaughter, in New York City. Davenport was convicted of first-degree manslaughter by the New York State Supreme Court back in May, according to Manhattan District Attorney Cyrus R. Vance Jr.
Davenport was expected to be sentenced on May 29, 2018, but the announcement of his sentencing was not given until Jan. 17 in a new press release. Hines and Davenport had been dating for several years and were reportedly living together in Washington Heights at the time of the crime. According to the district attorney’s office, the pair was outside the apartment at around 3:00 a.m. on Aug. 16, 2015, when Davenport kicked Hines, and she fell to the ground. He then pulled out a knife and attacked her, while witnesses called 911. Although 33-year-old Hines was rushed to Harlem Hospital, she was soon pronounced dead. Davenport was found to be under the influence of alcohol, phencyclidine (PCP), and other drugs, and police took him into custody at the scene. Hines’s last words were, “Why are you doing this?” reported the New York Post. A witness, 22-year-old Cristina Aviles, told the Post that she was nearby with a group of friends during the incident—but they were too scared to get close to the scene. “They were arguing. She was on the [ground], and he was on top of her, restraining her, stopping her from getting loose from his grip,” Aviles said to the Post. Davenport apologized during his sentencing hearing and said, “I don’t remember what happened,” according to The Associated Press. 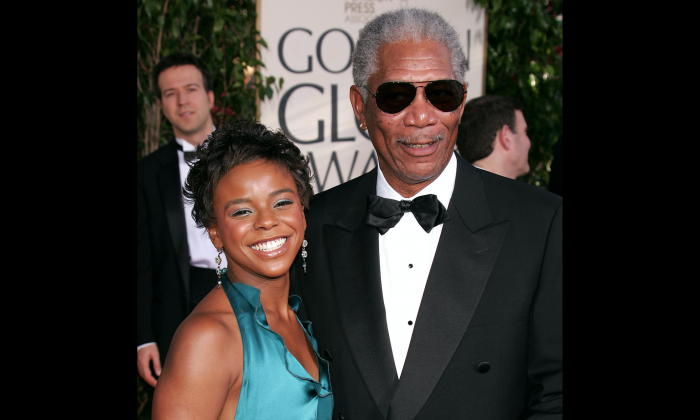 Hines was the granddaughter of Jeannette Adair Bradshaw, Morgan Freeman’s first wife. Although they were not related by blood, the 81-year-old actor later helped raise Hines after adopting her biological mother, Deena Adair, reported the Post. During Davenport’s trial, a defense lawyer claimed Hines had admitted to her boyfriend that she had been having an affair with the much-older Freeman before her murder. The actor has denied the alleged affair. Freeman has also faced allegations of sexual harassment and inappropriate behavior from other women, including CNN reporter Chloe Melas. After CNN published an article on the story in May 2018, Freeman demanded via a lawyer that the network retract the story. However, CNN refused.